Anti-Islam rallies have taken place across Australia, organized by the Reclaim Australia group. Police were forced to intervene in Melbourne as clashes broke out between anti-Islam and anti-racism protesters, with thousands attending the demonstrations. The Reclaim Australia community group, who organized protests in 16 cities and towns across the country, was protesting against Sharia law, halal and Islamization. They faced counter demonstrations from a left-wing umbrella group called No Room for Racism. 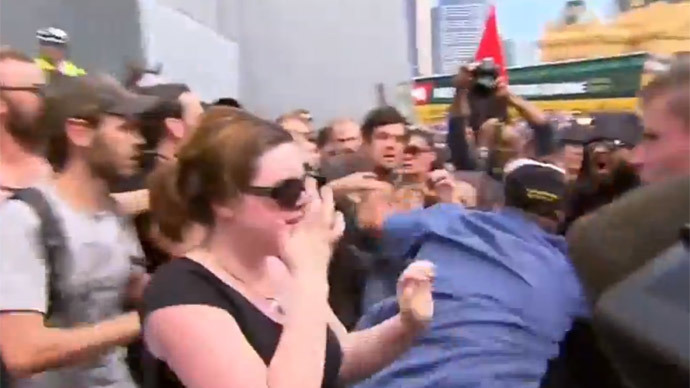 Some of the worst violence occurred in Federation Square in Melbourne, where police tried to keep anti-Islam and anti-racism protesters apart. A spokesman for the Victoria state ambulance service said that four people were treated for minor injuries, while police spokeswoman Belinda Betty said two men and a woman were arrested following the violence. More than 100 police were deployed with almost a dozen mounted police also helping to keep the situation under control. The Reclaim Australia group has faced claims by opponents that they are a racist organization. However, John Oliver, who organized the anti-Islam rallies say the group is just looking out for the interests of ordinary Australians. "I know in Sydney and Melbourne they've got Muslims already signed on to attend because they can see what's happening and they don't like what's happening," Oliver said, speaking to the Australian state broadcaster ABC. Another protester, John Bolton, said the Reclaim Australia group was opposed to extremism, but not Muslims in the wider community. "What I'm not against is ordinary Australian people who happen to be Muslims who follow their faith, they don't need anybody's permission provided they comply with the Australian civil and criminal law and want to comply with our constitution," Bolton added, according to ABC. The organizer of the anti-racist demonstration, Mel Gregson, said Reclaim Australia was gaining support by spreading “conspiracy theories,” as well as “implicating good Muslim people in the political movements of a tiny minority,” in regards to extremists who have joined the so-called Islamic State. Gregson added that the left-wing umbrella organization had decided to hold its rally at Federation Square, to oppose directly the message being espoused by Reclaim Australia. "We're not interested in holding our rally somewhere else and talking to people who already agree that racism is a bad thing — the vast majority of people in Australia agree with us on that," she said. "What we're trying to say is that this is dangerous to allow hate speech to occur on the streets of Melbourne." It's kinda ironic that protests about Islam apparently taking over Australia are on a weekend that's shut down for a different religion. Tensions between Australians and Muslims have been rising over the last six months. Australian police launched a series of anti-terrorism raids in September. There was a backlash against the Islamic community in Australia following a siege by an Iranian born Muslim man in Sydney last December, which left three people dead and four injured. A survey conducted by the University of Queensland at the start of 2015 said that as many as 75 percent of Australians Muslims believe they are unfairly targeted by anti-terrorism laws. Terror laws were again tightened after an 18 year-old man, who reportedly supported the terrorist organization the Islamic State, was shot dead after stabbing two police officers in Melbourne.